With the rear end work completed as much as possible for now, it is time to move on to the front suspension. A few options have been looked at to replace the old sigma/commodore setup with the main aims to have inexpensive readily available components, a low ride height and a supply of aftermarket parts suitable for racing. A couple of strut based options where tried but wouldn’t work for various reasons so I looked at an MX5 setup which met all the criteria as well as matching the rear end setup. 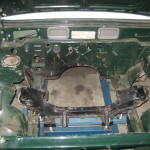 An MX5 front cradle with hub, arms and steering rack was obtained and a lot of measurements taken. 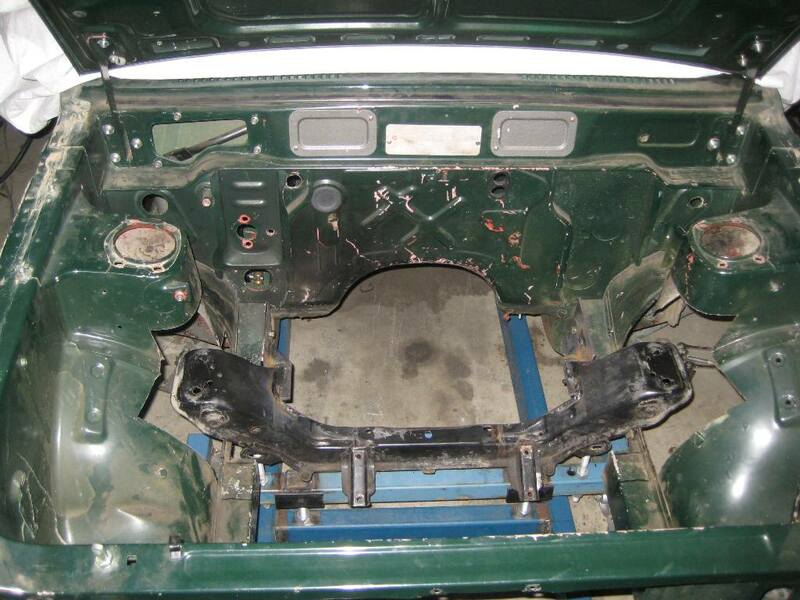 It was obvious from early on that the height of the front chassis rails was far from ideal for a low ride height and will need significant cutting to allow the lower pickup points to be in the correct location. The second more concerning problem was that the width of the lower arms put the rear most mount inside the cabin of the car. In order to get around this the arms will be swapped side to side so that the long section of the arm points forward and away from the cabin. This will require more work with ensuring the geometry is correct and that the steering rack does not make contact with the arms. Work has started by placing a section of the cradle in the engine bay and cutting both the inner guards and chassis rails to double check that everything will fit and work as anticipated. Cutting the inner guards is not as problematic as it would first appear as the move away from a strut setup means that they will no longer be a significant part of the chassis. Upper mounts will need to be made for the new shock absorbers but they will most likely be included in the forward section of the roll cage when it is built.